While the long-awaited Midtown East rezoning plan would allow buildings up to 30 percent taller, one developer ain’t waiting. L&L Holding Co. found workarounds to the city’s 1961 zoning allows, allowing them to redevelop 390 Madison and 425 Park avenues with or without the rezoning. Instead, David Levinson and Robert Lapidus’ firm employed creative designs at both towers to circumvent one old zoning rule in particular: a requirement to retain at least 25 percent of the old building’s structural steel. 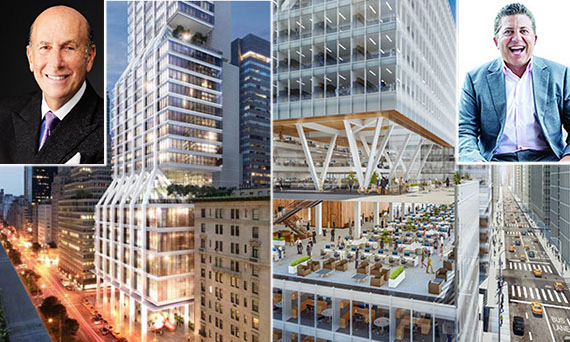 At 390 Madison, measuring 850,000 square feet, L&L and partner Clarion Partners are re-massing the building to make it taller and narrower, with the same FAR (floor area ratio) as the old one. And at 425 Park, L&L’s 670,000-square-foot tower with partner GreenOak Real Estate and Tokyu Land Corp., the building has a steel-framed tower with large windows and outdoor terraces. 390 Madison is set to open in late 2017, while 425 Park is slated for 2018. So far, hedge fund Citadel is taking 200,000 square feet at 425 Park, including penthouse floors rented for a record $300 per square foot. And restaurateurs Daniel Humm and Will Guidara, of Eleven Madison Park, are planning a 14,000-square-foot eatery over two floors. The rezoning proposal would allow 30 percent more density in a 78-block stretch of Midtown. But it must first wend its way through the six-month Uniform Land Review process, and then obtain a green light from the City Council and mayor.